When I say it was spectacular, I mean it was really hard. And easy, too, because it never once became a burden or a chore. There were times I was so cold I couldn’t breathe, coughing and gasping for air as I pulled off my face mask even though my nose started to freeze within seconds. There were times that my right knee became so stiff that I couldn’t bend it as I limped up hills, wondering if I’d be able to “de-rust” the hinge enough to pedal the last 10 miles to the end. But these issues seemed unimportant, the inevitable fee for coming to the White Mountains 100 somewhat under-prepared. 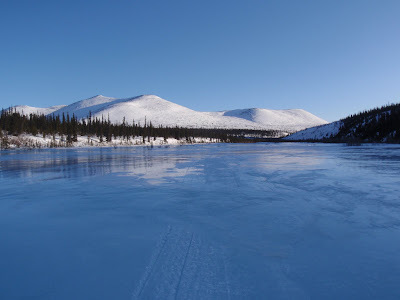 And they were a small price to pay for a chance to spend a day in my happy place — a place cut into a small, wind-swept mountain range in the heart of Alaska, a place where wildfire-scorched spruce trees stoop over frozen swamps and people grin through ice-ringed face masks. They too understand the beauty and discovery of these journeys through the soul. 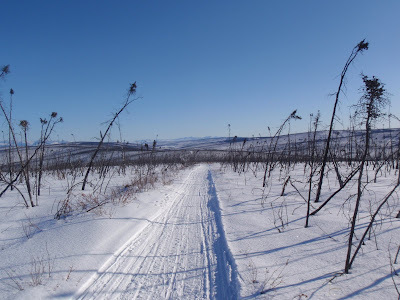 This was the inaugural year for the White Mountains 100, a 100-mile bike, ski and foot race on a large loop of remote snowmobile trails 40 miles north of Fairbanks. The thing that impressed me most about this race was just how brilliantly organized it was. 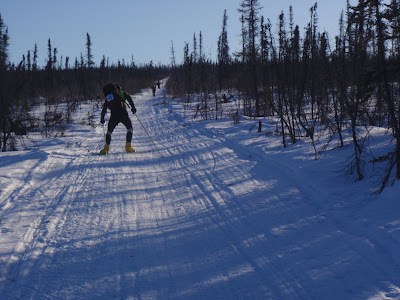 Basically, a small group of Fairbanks skiers decided it would be fun to hold an endurance race on their home trails. 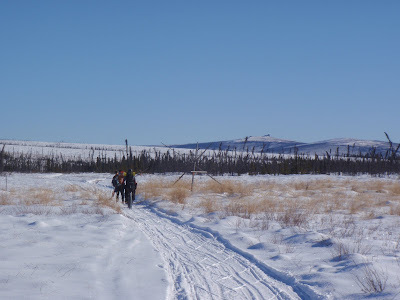 Within a matter of months, their race was full with 50 racers from Fairbanks and Anchorage (and one straggler from Juneau), a full army of friendly volunteers and a luxurious menu of trailside meals, homemade cookies and medical support. Although I was intrigued by this new winter endurance race, I admit it was only on the edge of my radar. 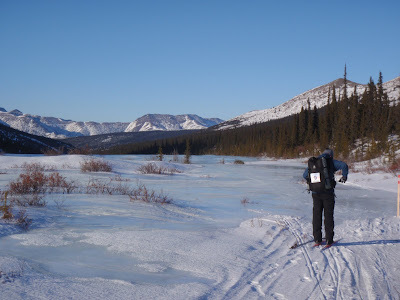 I had met one of the co-organizers, a skier named Ed Plumb, during the 2009 Iditarod Trail Invitational. I was holed up in Yentna Station with five swollen, purple toes and a black cloud hanging over my head. Ed offered a few kind words that helped put the whole sad situation in perspective, and even followed up to ask about my recovery after he successfully completed the race. 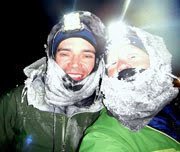 He was kind enough to e-mail me early in the White Mountains 100 planning, and again when the race was nearly full. I decided to sign up even though I felt ambivalent about it. The cost of travel would be significant, preparations would be tough and I was coping with shifts in my own attitude about racing in general. As my life fell into deeper unrest, this ambivalence strengthened, until the race was days away and I realized that my preparations only amounted to about three weeks of actual focused training. My snow bike laid in pieces in my room. I hadn't yet chosen my "kit." I was mired in stressful logistics of moving away from Juneau, and I was ready to pull the plug on the race without regret. But then I didn't. I'm so glad I didn't. Saturday was a whirlwind — meeting the friendly Fairbanks skiers, rushing around town with Bjorn as he bought up supplies for a three-week climbing expedition into the Hayes Range, attending the pre-race meeting, having dinner with the fast bikers and stumbling upstairs to my own explosion of gear. I finally crawled into bed at midnight and slept like a log out of sheer exhaustion. I woke up at 5:30 a.m. Sunday morning to carpool out to the start with Ed. His eyes had the glazed-over look of a struck deer, and he admitted that organizing the race proved far more all-consuming than he ever imagined. "I haven't even thought about skiing," he said, even as he faced the 100-mile effort that loomed in front of us. I watched the thermometer on his dashboard drift from 10 above all the way to 18 below in the low-lying valleys. I felt my own eyes glaze over, struck by a vague sense of doom. The hour leading up to a race is always the worst, and the White Mountains 100 was no different. I stepped out of Ed's truck and the cold wind hit me like a sucker punch. I froze my fingers while trying to put my bike together, waited in line at the outhouse to purge the meager contents of my breakfast and forgot to sign in. But when someone finally yelled, "Go!," all of the fatigue and anxiety melted away as my mind instantly shifted to the focus of the task at hand. I pedaled up the first hill in a wash of relief, because I was on the trail and so I no longer had to think about it. All I had to do was pedal. And compared to the rest of life, pedaling is amazingly easy. For many hours, the White Mountains 100 was pure fun. I was struck by the sheer amount of climbing. In my pre-race ambivalence, I actually never even looked at the elevation profile, which in the end would net nearly 8,000 feet of gain. I guess I should have expected as much from a race with the word "Mountains" in the name. Still, I relished in the work, powering up the nicely packed trail at a paltry — but satisfying — 4.5 mph. The downhill runs were like the best kind of mountain biking, smooth and flowing with a few blissful "big airs" over the snowmobile moguls. An air inversion caused intriguing temperature fluctuations — I'd climb high with the warm sun caressing my face, and then drop into a subzero sinkhole as my quickly-applied face mask filled with ice. For several miles I shadowed a couple of skate skiers, which was a cool experience in itself — two very different modes of travel, perfectly synchronized. My main point of stress was overflow, which the White Mountains region has an abundance of. 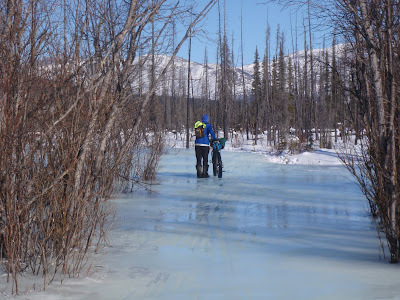 Overflow is water that gurgles up from ice-covered stream beds, refreezing on top of the snow until the ground is covered in mounds of wet ice. It's treacherously slick, but that's the least of the concern, because a badly placed foot can punch into deeper pools of unfrozen water, wetting vital gear and body parts — a bad, bad thing in subzero temperatures. Because of my previous frostbite experience, every loud crack or change of color on the ice was heart-stopping scary, but it only added to my overall excitement about the course. The White Mountains were harsh, they were real, and they were amazingly within my grasp. And this harsh, real landscape was also breathtakingly beautiful. 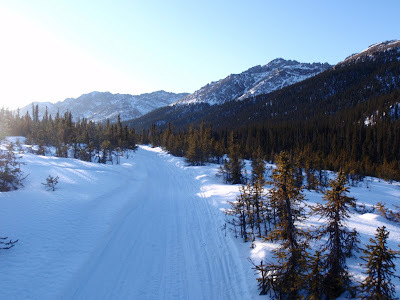 We coastal Alaskans have a tendency to write off the Interior as a flat, frigid swamp, but it is actually ringed with snow-swept mountains and craggy cliffs. The weather was gorgeous if a bit cold for this coastal girl, and a brisk headwind stung my exposed skin. Still, I felt strong and I was pounding down the calories. I stopped briefly at the Cache Mountain cabin at mile 36. A fire raged in the wood stove and the tiny single-room structure was clogged with racers and stiflingly hot. I ate handfuls of cheese cubes and a brownie as I chatted with Anchorage cyclists Ted Cahalane and Brian Garcia. Everyone was in a good mood but ready to admit we were starting to feel it. On a snow bike, tackling a mountain course in subzero windchill, a race pace of 7 mph feels fast and 36 miles feels like a long way. And the big climb was yet to come. After several more miles of rollers, the course began the steady, 1,800-foot ascent to the "Divide," a 3,500-foot alpine pass. 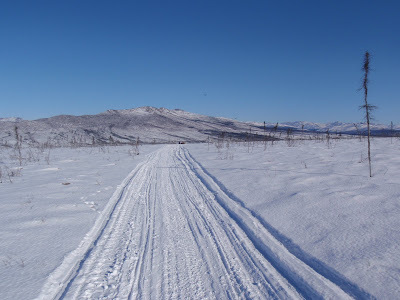 The snow had softened in the sun and was churned up by previous racers, which made the going incredibly slow. The trail was rideable, but it eventually became a decision of whether I wanted to struggle at 90-percent effort a move 3.5 mph or push my ~50-pound bike at 70-percent effort and move 2.5 mph. I was too tired to do the math, but walking sure felt better, so I walked. A few skiers caught up and passed me, justifiably gloating at the anchor I was dragging up the mountain. But I am always willing to do the work for a breath of open mountain air, even if it is driven by stunningly cold wind. I stopped at the top for several minutes, completely exposed to the wind and cold, just to soak in the wonder of the moment. I sucked on some deep-frozen Sour Patch Kids and analyzed the wind's artwork, carved in flowing strokes across the open tundra. It was 4 p.m. I was 50 miles and eight hours into the race, still on my best-case-scenario pace, feeling strong. 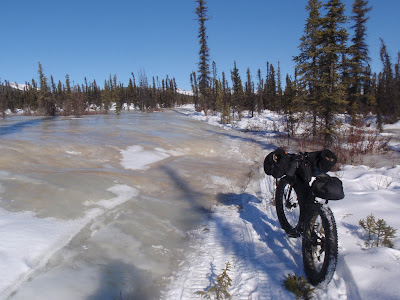 I hopped back on the bike and churned over the drifted trail, swerving and bouncing across the rough surface. I passed Ted, who was walking his bike downhill. "You're having better luck than I am," he called out. "It's not easy, but it's doable," I yelled back. A few minutes later, I bounced sideways off a mogul and landed face-first into a pillow of snow. I was still extracting myself when skiers Chris Wrobel and Scott Hauser came up from behind. I quickly rolled back into the snow as they whisked by, calling out to make sure I was OK. Ten minutes and 1,000 feet of descent later, we were all standing at the edge of the Ice Lakes. The Ice Lakes are actually a mile-long stretch of overflow that is very unpredictable. Ice conditions change by the hour and we had all been warned to pass through this area with extreme care. Chris and Scott gave up on skiing early and donned overboots and ice creepers. I had bolts screwed into the soles of my boots, but they weren't quite enough to actually grip the wet ice. I skittered across the downhill-sloping surface as the frigid wind blew at my side, with my bike acting like an uncontrollable sail. I walked through ankle deep pools of slush, areas where any kind of fall would be disastrous. My heart raced and anxiety coursed through my veins like hot lead even as my body became colder and colder. I started to shiver but I couldn't move any faster for fear of losing my balance. My fingers went numb, but I didn't want to stop and find my mittens for the same reason. It was a painfully slow march to the other side, and I had no choice but to endure it. Excellent write up, at least so far. But I'm sure the rest will be just as gripping! 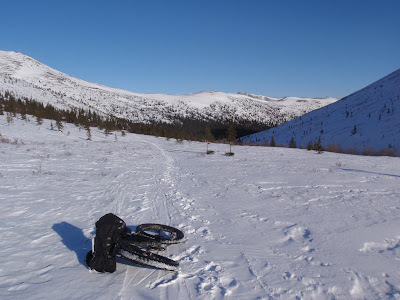 Alaska sounds like a foreign planet, and the concept of riding a mountain bike in the snow over any serious distance is something that has never really occurred to me. Great post! You really seem to be gaining confidence and skill on the trail. 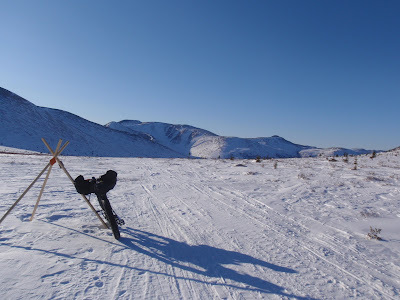 Maybe subzero snow biking will make it to the winter Olympics someday. Do people in other countries practice this crazy sport? Congratulations on your finish time! An amazing experience, to be sure. Thanks for the post. Looking forward to the remainder. Awesome Jill! I can't wait to hear the rest. Congratulations on your great race. You did terrific. I am always amazed at what you can accomplish. While I believe that Alaska is a beautiful place, I can't imagine living in the cold everyday, let alone embracing it as you do. Great writing and incredible experience. The way balance the beauty of the course and the harsh conditions makes for great reading. And I am amazed at your courage and stamina too. I have very fond memories of my extended skijor trips through the Whites Mountains, or the "Whites" as we'd say in Fairbanks. I've stood in many of those places from which you took a photograph, and I have to say from a few thousand miles south, (where I currently reside) I really do miss the White Mountains. I was so looking forward to reading your race report. It is so beautiful out there! You've really learned the skills and self-confidence to endure some amazing stuff. Awesome tale. Looking forward to reading the rest. This race seems quite different from the others I read about. You raced strong, your consistent pace paid huge dividends. It was great to finally meet you in person- I wish you could be there tonight for the photo-sharing and post-race party! (I'd love to see ALL of your race photos). Congratulations- you did an awesome job out there. Jill...you continually blow my mind with what you call fun! You somehow make what amounts to an incredible amount of personal suffering into something that sounds like I should give it a try someday (oh wait...I don't do very well in cold, so I guess not). Can't wait to read the rest. You are truly a testament to what CAN be done. I bow to you (again). Oops..meant to put this in my comment and forgot. I saw the movie "Iron Will" this weekend (GREAT Movie!) and IMMEDIATLY thought of you! That was just a movie...but you are IRON JILL for REAL! You're awesome, Jill. Congrats on your finish. Excellent write-up. 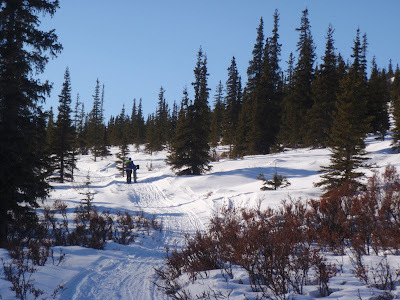 It's great to hear your experience on the trail, as being on a snowmachine was nowhere near as desirable. The writing, the photos, the achievement... In short, you. Hope you've had a rest, too. Jill, Your first few lines make so much sense to me. I said to Brian on the drive home, "It was harder than I imagined it would be, but it was also easier than I imagined it would be." Harder because there were soooo many long hills, brutal wind, and so much getting on and off the bike because of overflow. But easier in the sense that I never felt like I was not going to finish or that I didn't want to continue. I think the amazing scenery, people, and the knowledge that there would always be another fun downhill stretch kept me going. I was actually sad when the last mile flew by and we were at the parking lot so quickly. I didn't even have time to stop and let it all sink in.